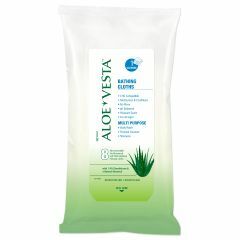 Aloe Vesta Bathing Cloths are a moisturizing cleansing system for no-rinse bed bathing. Each bag contains eight pre-moistened cloths for cleansing body areas. Aloe Vesta Bathing Cloths contain natural botanical oils which moisturize and condition the skin making it feel smooth and soft without leaving a sticky residue. These are my favorite wipes! Soothes Skin. Smells Great. Softens Skin. Moisturizes. Daily Use. Baths. Travel. Cleansing. Body. My daughter is special needs and is incontinent at times. These are the best wipes to use on her very sensitive skin as they are gentle, clean very well and smell nice. I use them on her every day; they are also handy to take when traveling. Gently cleans skin. Very light fragrance. Soft cloth. Rinseless cleanser. Great cleansing when a bath or shower is not possible. Gentle on the skin and has little or no fragrance. Make you feel like a million bucks! Soothes Skin. Non-Greasy. Smells Great. Moisturizes. Not Greasy. when you can't shower these are great , and make you clean. There is no residue or bad smell and it drys fast. Soothes Skin. Non-Greasy. Smells Great. Used this product with my elderly parent on a daily basis. It was a good way to cleanse without drying his skin. Durable. Soothes Skin. Non-Greasy. Smells Great. Softens Skin. Moisturizes. Lightweight. Not Greasy. Light. Cannoot be flushed. Cannot be flushed. May not be portable. Daily Use. Baths. Travel. Cleansing. Budget Buyer. Quality Oriented. Minimalist. I unfortunately swing between constipation and diahhrea, and find that this product works wonders when I am suffering with the latter problem. It cleans beautifully and sooths the delicate skin. I recommend it highly!